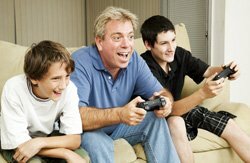 As the new generations of kids come along, video game usage is continually on the rise. In today’s generations kids will be growing up with high quality video game systems such as Xbox, PlayStation, Nintendo, etc. at a very young age. You can tell that the age in which kids are starting to play video games is getting lower by just turning on your microphone in a multiplayer game. More often than not there will be a kid sounding as if he’s ten on his microphone, screaming into the microphone cuss words and phrases that I would have been killed for saying as a kid. So as video games rise more and more, so do the possibilities of marketing through them. The world of mobile marketing is a big one, and there are plenty of advertising opportunities still there. Most games that are played require a loading screen between levels or maps and cause a player to wait their impatiently, tapping there feet and repeating “come on, come on, come on”. Marketers have taken notice of these and have tried out placing ads in these loading screens. It’s a great way to have their ad displayed and a gamer is most likely going to be stuck looking at it as they wait for the loading to finish. Most retail games haven’t had it, but it has been tried in a few, such as Wipeout HD. However, free-to-play games tend to fare better with including these advertisements. Because gamers have a favorable impression of the company, because they allow the game to be free. Also, these ads have shown that gamers recall these ads better that are shown in their game, most likely because of their intense focus on the gameplay. The good thing about this is that these games tend to be played by people all over the world. One of the biggest benefits of internet marketing is its ability to connect with users close by while simultaneously reaching those on the other side of the country. Other pay-to-play games tend to try not to use in game advertising, especially in fantasy games like World of Warcraft. This makes sense to anyone familiar with the game because it would be nearly impossible to slyly sneak advertising of real world products into a game based on creatures like trolls and elves that rely on magical powers. Realizing this is important because in testing, it has been shown that advertising that is congruent with the atmosphere of the game is more likely to sit well with the players. For example, it would be kind of odd seeing advertising for make-up or flowers in Call of Duty. It would throw gamers off, but probably manage to get a few chuckles out of some gamers.